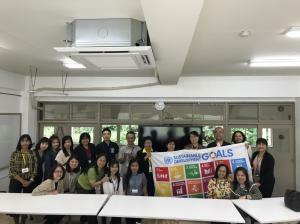 Upon the request from the Bangkok Metropolitan Administration (BMA), UNCRD conducted a training course on localizing SDGs from 2 to 13 July in Aichi Prefecture, Japan. This training course was specifically designed for the needs of the BMA, taking into account the current condition in Bangkok, Thailand. The training course was attended by 14 participants, including Division Directors and senior policy and planning analysts of the Strategy and Evaluation Department, BMA with all the cost born by the requesting entity. 4.	to expose participants to actual situations and experiences of local governments and communities in Nagoya and other municipalities in Aichi. -	Enhanced awareness of participants about applicable and feasible programme and project options for promoting SDGs in rapidly growing Bangkok.